We have emerged stronger!! We move forward as one people: the Imperial citizens of the first Galactic Empire. We have prevailed. Ten thousand years of peace begins today. “STAR WARS – A False Hope”, Weekend Wide Game’s 6th South event saw SC&T Rovers turn Potato Point National Park into a galaxy far far away. 120 Scouts in 26 Patrols attended, with planets including Dathomir, Coruscant, Kashyyyk, Kamino, Tatooine and Naboo. Stationed on or between these planets, saw 30+ Venturers, 15 Rovers and 50 Leaders/Helpers acting as Imperial Troopers, Imperial Intelligence and “Natives”. Coruscant, also known as the Imperial Center, was one of the main trafficking routes and trade points where citizens were able to Bank Credits, Trade goods to upgrade their ships, and event attempt to pick-pocket unknowing victims. Kashyyyk (the Wookie Planet) and its lush tree filled world was home to many Wookies. Citizens had the ability to be united as Wookie Worthy, and join the Wookie in the new Galactic Empire. Kamino tested worthiness of a citizen’s ability to fight as a team. Successful citizens could be deemed Clone worthy at any time, while others are banished forever. The training at Kamino, however, could be dangerous, as it was known for citizens to end up in the surrounding waters of the planet, lost forever. Tatooine, a desolate place, allowed for citizen’s to wager or compete in the ever-so-famous Podrace. If podracing wasn’t a patrol’s fancy, further options of Droid Repairs or even auditioning for the Cantina band were available. Naboo and its luscious greenery offered many native challenges. From retrieving the Gungun Boomaâ€™s from the deployment machine, throwing Boomas, hunting down Jar Jar Binks and even arbitrary debates which included topics such as; “All droids should be reprogrammed with a Scottish accent”, and “The Imperial March is to be replaced with the Imperial Waltz”. The Galactic Empire have proven it’s strength once again – Rebel Scum thought they’d found the leaked Death Star Plans, however our spies and strengthened allies successfully re-acquired these plans early Sunday morning. The Military Battle Station is far more superior to any battle station ever created! This event was the first to offer a new game ‘mechanic’ – a live trading market. Patrols could purchase goods at one world, and sell these goods at another. Goods varied in rates, which were defined by the availability of the type of goods at each planet. At the conclusion of the event, Potato Point RFS Volunteers once again put on a display for Scouts allowing WWG Admins some much-needed breathing time to collate the final scores. 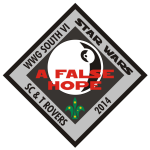 The results for WWG South VI – “Star Wars – A False Hope” are below. The South Coast & Tablelands Weekend Wide Game Committee would once again like to extend a heartfelt ‘thanks’ to all the Venturers, Rovers & Leaders who assisted throughout the weekend. An additional thank you to our Service Leader Caterers – Barbara Osseweyer and Rae Heaton (including minions – Kerrie Latham and John Osseweyer), as well as our First Aider Colin Thompson – your assistance is highly appreciative.